Indulge your sweet tooth with the tempting fragrance of home-baked peach cobbler. A calorie-free way to savor the pleasures of this perennial dessert favorite! A happy reminder of the sweet moments of life! 45 hours burn time. 7.3 ounce.Soy blend wax with glass lidded jar. 2¾" diameter x 3½" high. 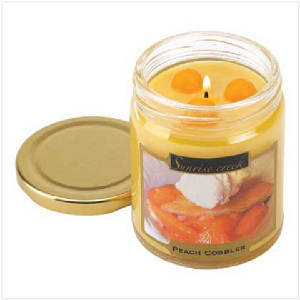 Warm your surroundings with the luscious scent of your favorite sweet treat! 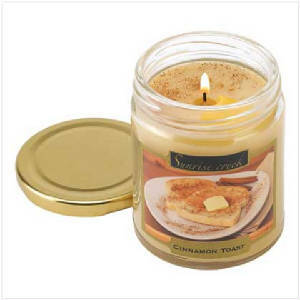 Highly scented jar candle bears the delicious aroma of buttery cinnamon toast. This wonderful fragrance brings to mind the simple pleasures of a lovely leisurely breakfast! 45 hours burn time. 7.3 ounce. Soy blend wax with glass lidded jar. 2¾" diameter x 3½" high.